I've been getting into the holiday spirit a little earlier this year so I wanted to pass along this quick and easy way to add a little Christmas to your hot chocolate. Those looks DELICIOUS, Melissa. Yum! This is such a good idea!! I love it! yum!!!! that's so clever and simple to make! Mmm my mouth is watering! 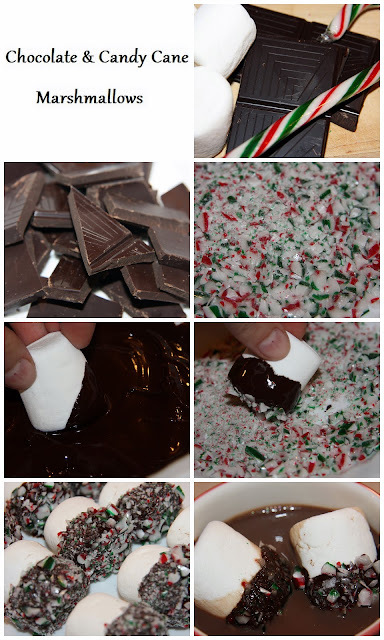 This looks so delicious and I'm not even a fan of candy canes or marshmallows, but I might just try it! Oh and your new hair looks terrific! ooh, looks so yummy! perfect as a christmas treat! YUM! They look delicious. Perfect holiday idea! yup, you are my new best friend!!! I think I love chocolate just as much as you do!!! I am now following you as well!! I am your newest follower. great blog. love marshmallows. Oh man. I LOVE marshmallows... it's a bit of a weakness of mine. they so soft, mushy and tasty! - the best!!! I am seriously SO excited to make these babies!!! Ok.. I need to make these! What a fun idea and they look so festive. of all people, my massage therapist gave me a small bag of festive treats for the holidays. one of the items was chocolate covered marshmallows ... no candy cane crumbs though, i'll have to suggest that to her next time!